Used to add a Google map to your page. 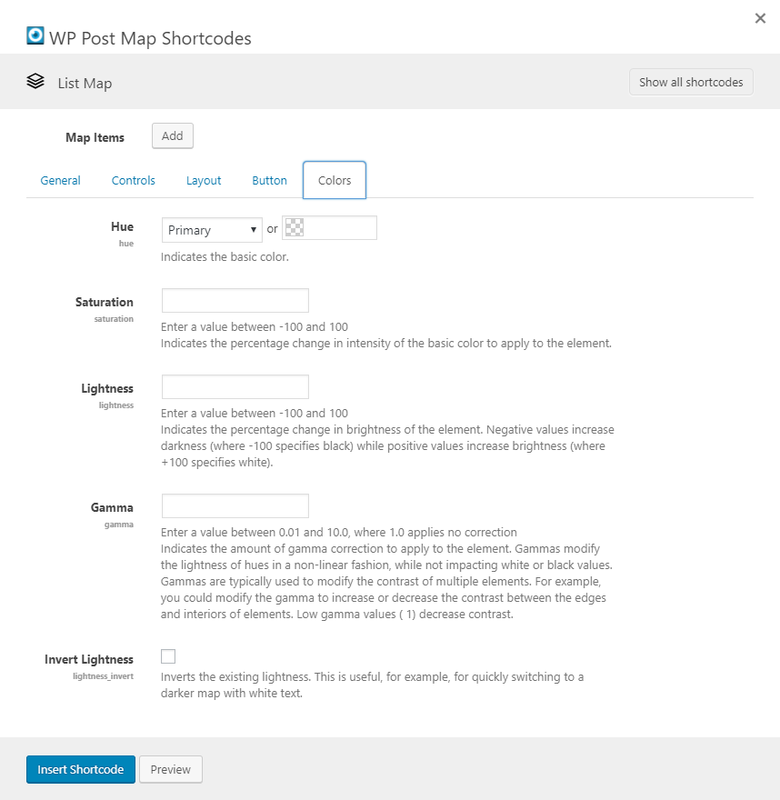 This shortcode allows you to add post lists to your map. If the post has an address or latitude and longitude field, you can select it from within the shortcode and include the post on the map. There are a number of templates to choose from for the list (if you want to show the list). Check this if you want markers that are close to be clustered together until zoomed in. This will be the location of the map. If you choose "Left" or "Right", the section for the list will be the same height as the map and will scroll. The list will be hidden for smaller devices, showing just the map. The options on the Layout tab allow you to setup how the list will show, if in fact you want a list to show. You can also select the template to be used for the InfoWindow on the map. Check this option if you want to show the list of posts. If this is unchecked, only the map will show, with the markers. Template used for building the list. This allows you to show the posts in a different layout. Number of words to be shown in the template. This allows you to control how much text is shown. You may want more text to be shown for one template as opposed to another. Background color of the highlighted post when selected on the map. If you click the marker on the map or the map button in the list, the background color of the list item will be highlighted with this color. Template used for building the infowindow on the map (when a marker is clicked). Number of words to be shown in the infowindow template. This allows you to control how much text is shown. Set the text for the button in the list that links to the post. Default is "Read More". Set the color for the button in the list that links to the post. 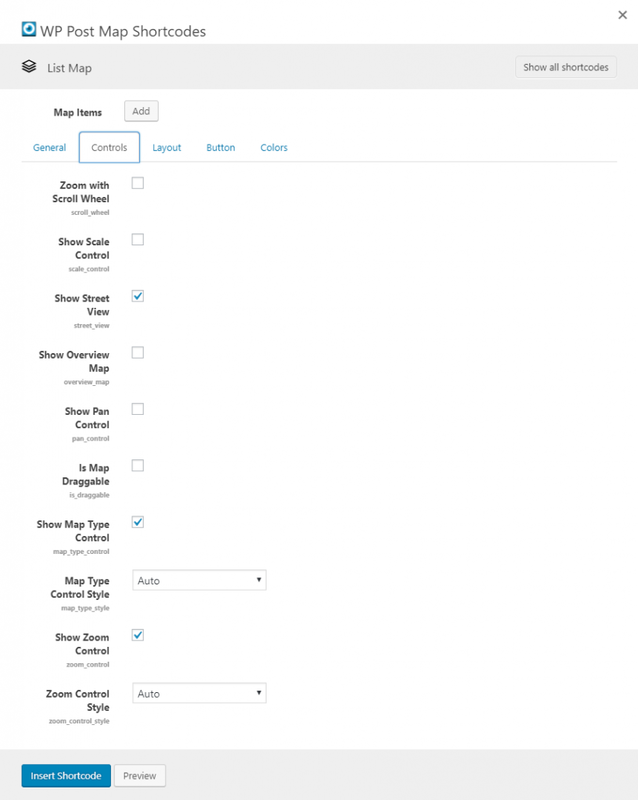 Default is "Primary", which can be changed in the WP Post Map settings. Set the font color for the button in the list that links to the post. Default is white. Set the border radius for the button in the list that links to the post. By default, there is no border radius, so the button has square corners. Select the size that you want to use for the button. Each increase in size gives a little more padding around the text. The default size is "mini". Set the text for the button in the list that links to the map, and opens the map marker infowindow. Default is "Read More". Set the color for the button in the list that links to the map, and opens the map marker infowindow. 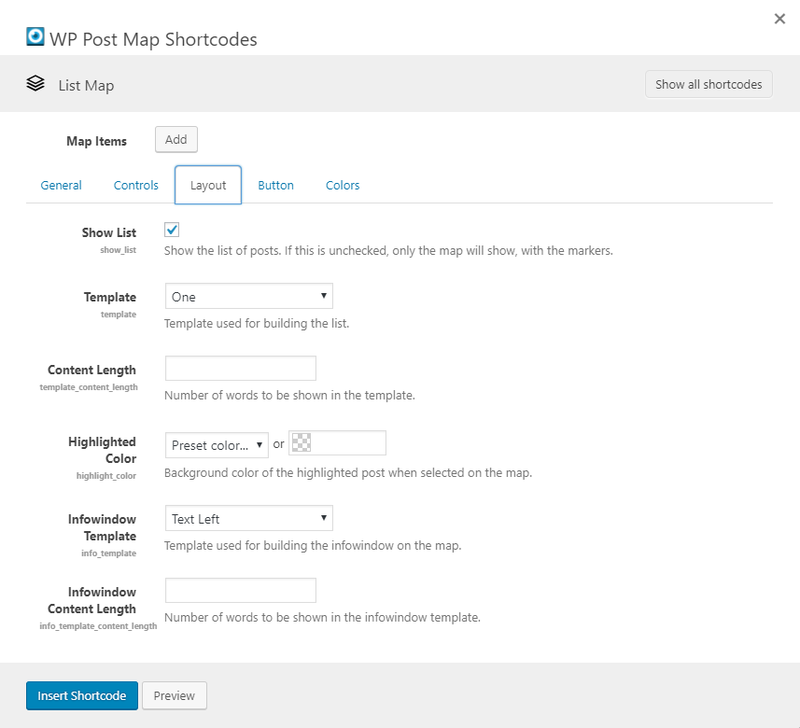 Default is "Primary", which can be changed in the WP Post Map settings. Set the font color for the button in the list that links to the map, and opens the map marker infowindow. Default is white. Set the border radius for the button in the list that links to the map, and opens the map marker infowindow. By default, there is no border radius, so the button has square corners. 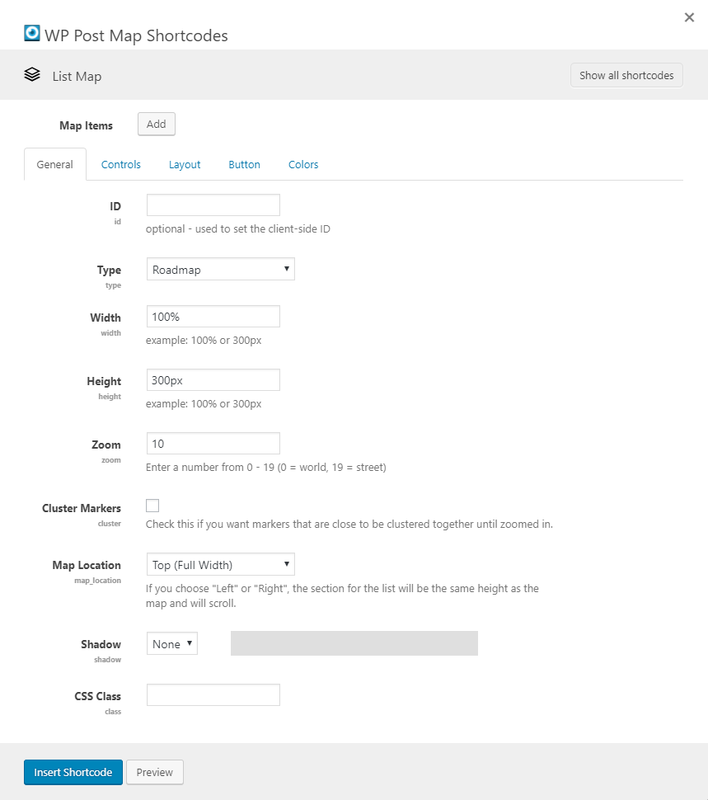 Select the post type that you want to use to build the list for the map. Select the taxonomy if you want to limit the posts. As an example, you may only want to show posts that are from a particular category. Once a taxonomy is selected, the Category field will be filled below. Select the categories that you want to show. To select multiples, hold down the 'Ctrl' key while you click the items. Choose the field for the post type that holds the address. This needs to be a full address. 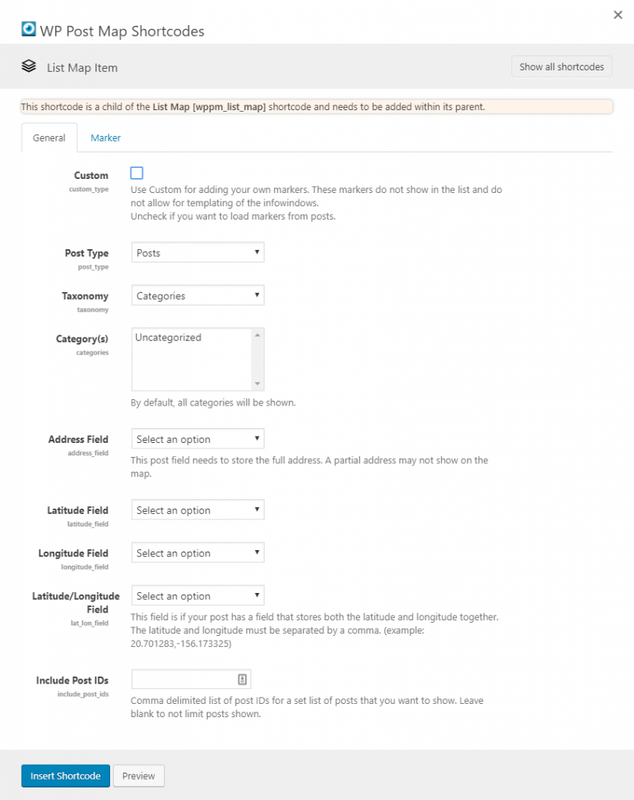 Choose the field for the post type that holds the latitude. This should be just the latitude. Choose the field for the post type that holds the longitude. This should be just the longitude. Comma delimited list of post IDs for a set list of posts that you want to show. Leave blank to not limit posts shown. The options in this section are for the Markers. Select the type of marker that is going to be used. Use the post featured image as the custom marker. 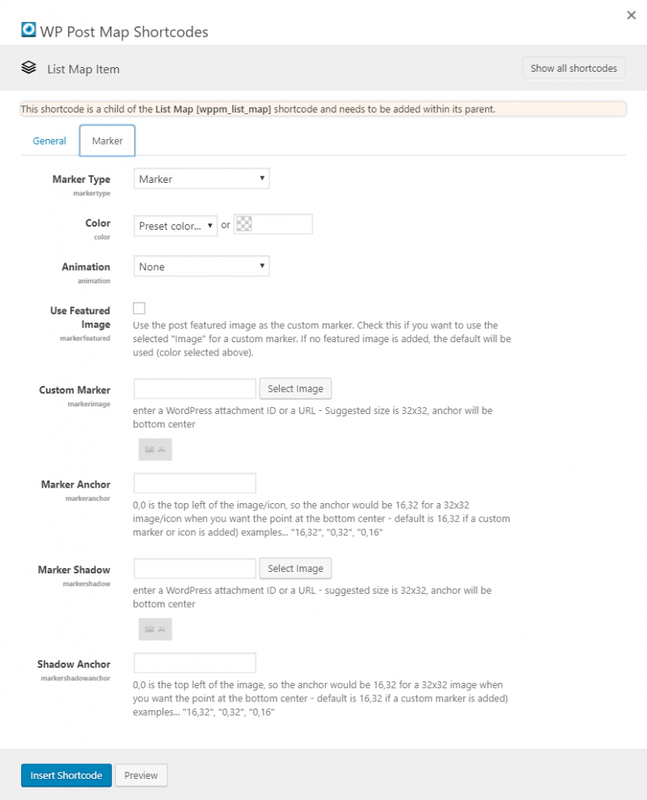 Check this if you want to use the selected "Image" for a custom marker. If no featured image is added, the default will be used (color selected above).